Horrible conditions and constant showers could not dampen the spirits and enthusiasm of the Deeley Harley-Davidson® Canada XR1200® contingent at its inaugural performance in the Canadian Superbike round one weekend of the 2011 season. Canada’s Snowbirds did a fly-by, seeming to tear a hole in the unrelenting grey blanket that hovered overhead of Circuit ICAR in Mirabel, Quebec. Skies began to clear and the difficult course dried long enough for the Harley-Davidson® XR1200® motorcycles to make their appearance on the track for qualifying. Thirteen riders rolled out onto the track for the first laps of the very popular XR1200® spec class and, as excited fans jostled for position behind the barriers, riders got their first chance to ride the bikes in the heat of battle.Handlebar-to-handlebar action became common and, almost Immediately, the gauntlet was thrown as 17-yearold Cody Matechuk, racing for Privateers Harley-Davidson®, diced it out with Ruthless Racing Inc. rider, Darren James, and MotoSports Plus rider, Steve Crevier. By the end of the 20-minute session, Matechuk posted the fastest qualifying time of 1:30.433, earning him the Tactical Products Luminox watch for winning the pole position. James closely followed suit in second and Crevier boasted the third fastest time. Harley-Davidson®, diced it out with Elie Daccache. Back up front, Matechuk and Crevier slugged it out in every corner while James ran a close third just biding his time to strike. As the 14-lap race wore down, traffic became an issue and James lost several positions. This was all Matechuk needed as he crossed the line with just a wheel length to spare ahead of Crevier, leaving Darren James to settle for a third place finish. Crevier said after the race, “I just can’t believe I got beat by a kid, but it was a lot of fun.” An elated Matechuk commented after, “It was great race. Steve got up there and he kept showing me a wheel.” Matechuk capped of his weekend by also walking away with the Performance Undergear “Performance of the Race” Award. Missing the race weekend were veteran Ruthless Racing Inc. rider, Dave Estok, and Freedom Harley-Davidson® rider, Steven Nickerson. Both riders are nursing injuries and hope to return to action for the next round at Shannonville Motorsports Park on July 2 and 3. 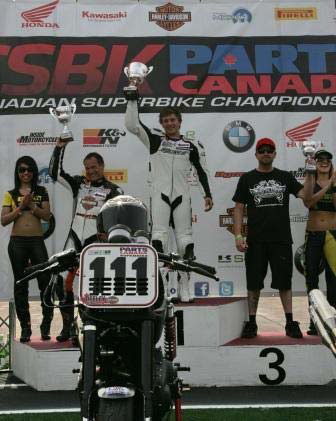 For further information and race results, please refer to http://www.csbk.ca. Deeley Harley-Davidson® Canada is the exclusive Canadian distributor of Harley-Davidson® motorcycles, Genuine Motor Parts and Accessories, and MotorClothes® apparel, which are provided through a national network of authorized Harley-Davidson® Retailers. Office and distribution warehouse facilities are located in Richmond, British Columbia, and Concord, Ontario. 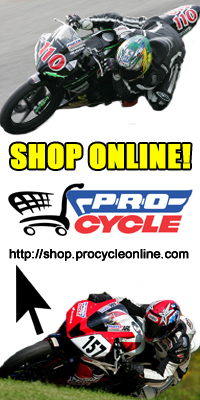 Please visit http://www.harleycanada.com for further information on Harley-Davidson® products in Canada. Posted on June 1, 2011, in CSBK - Canadian Superbike Series. Bookmark the permalink. Leave a comment.